UN peacekeeping missions operate in the most dangerous and difficult environments in the world, dealing with conflicts – or their aftermath – which others cannot or will not address. We can achieve what others can’t, but success is never guaranteed. We have, built up an impressive record of peacekeeping achievements over more than 70 years of our existence, including winning the Nobel Peace Prize. Since 1948, the UN has helped end conflicts and foster reconciliation by conducting successful peacekeeping operations in dozens of countries, including Cambodia, El Salvador, Guatemala, Mozambique, Namibia and Tajikistan. 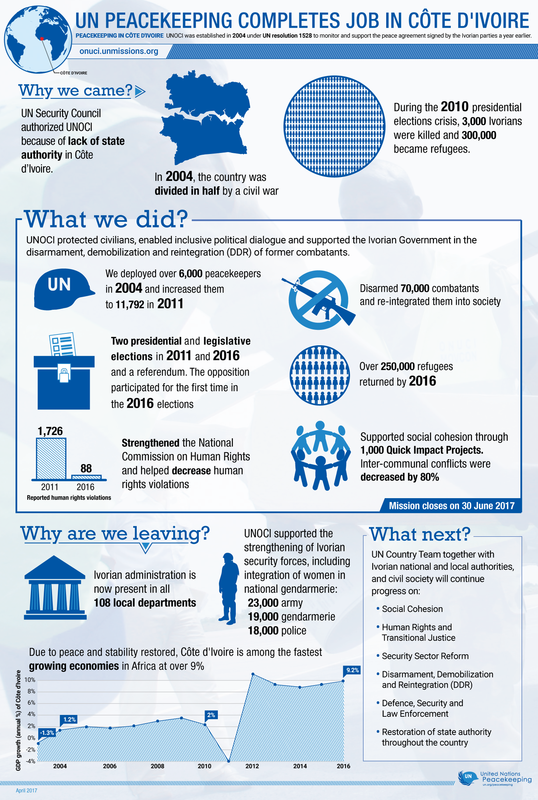 UN peacekeeping has also made a real difference in other places with recently completed or on-going operations such as Sierra Leone, Burundi, Côte d’Ivoire, Timor-Leste, Liberia, Haiti and Kosovo. By providing basic security guarantees and responding to crises, these UN operations have supported political transitions and helped buttress fragile new state institutions. They have helped countries to close the chapter of conflict and open a path to normal development, even if major peacebuilding challenges remain. In other instances, however, UN peacekeeping – and the response by the international community as a whole – have been challenged and found wanting, for instance in Somalia, Rwanda and the former Yugoslavia in the early 1990s. These setbacks provided important lessons for the international community when deciding how and when to deploy and support UN peacekeeping as a tool to restore and maintain international peace and security. What factors are required for success? Promote national and local ownership of the peace process in the host country. The utmost sensitivity towards the local population and upholding the highest standards of professionalism and good conduct (peacekeepers must avoid becoming part of the problem).